This Modern-Shed twin studio is made with beautiful redwood siding. 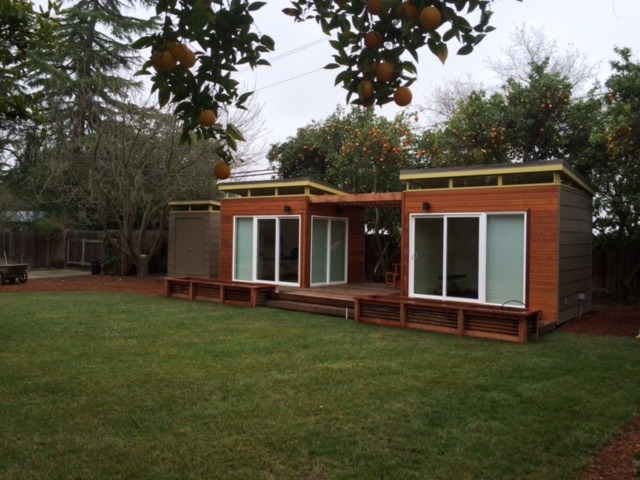 SACRAMENTO — There’s never too much of a good thing, especially when it comes to Modern-Shed. That’s what Jim from Davis realized when he and his wife decided they needed more space at their rural area home and ended up with not one, not two, but three Modern-Sheds. The couple’s vision for three Modern-Sheds evolved — initially, they knew they wanted a new shed for their gardening supplies and storage, but they also wanted space to work out and work on their hobbies. Jim and his wife actually have three Modern-Sheds — a smaller 6′ by 8′ garden shed sits to the left of the twin studios. 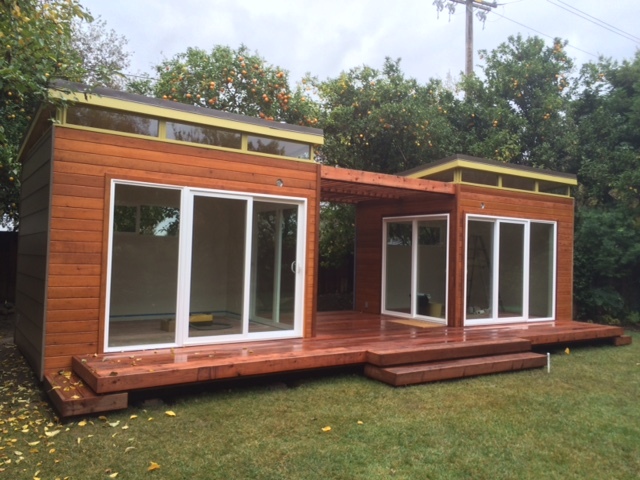 He and his wife decided on twin studios, both 10’ by 12’, that are adjoined by a deck and overhead trellis. One of the sheds is used as a fitness studio, while the other is a work space for Jim, who has a pilot license. Though he is retired, Jim likes to have someplace to go to read or plan flying trips. 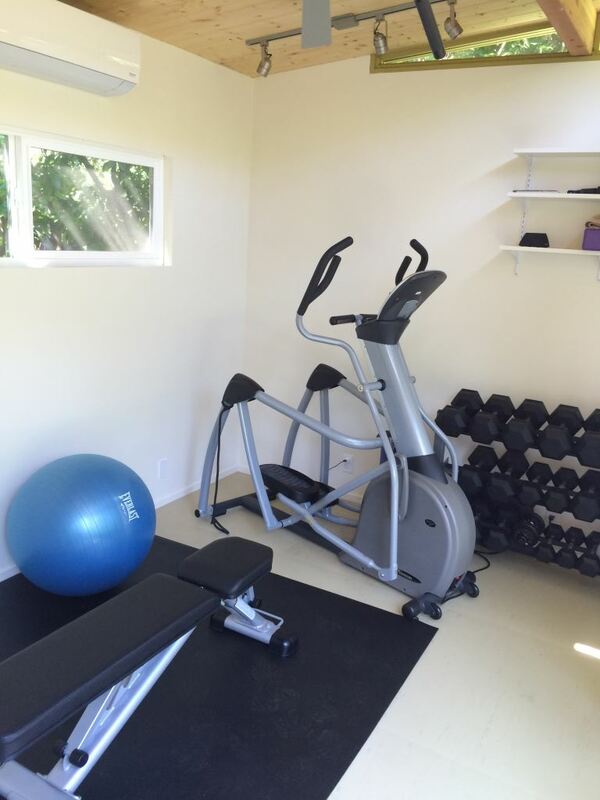 Jim uses one of the 10′ by 12′ studios as a fitness space. The couple discovered Modern-Shed from a magazine article years ago and thought it sounded like a good idea to get the space they needed without spending a lot of time on construction. The couple’s third Modern-Shed, a 6’ by 8’ garden shed, sits next to the twin studios a couple hundred feet from the house, separated from the house by a pool and a garden. 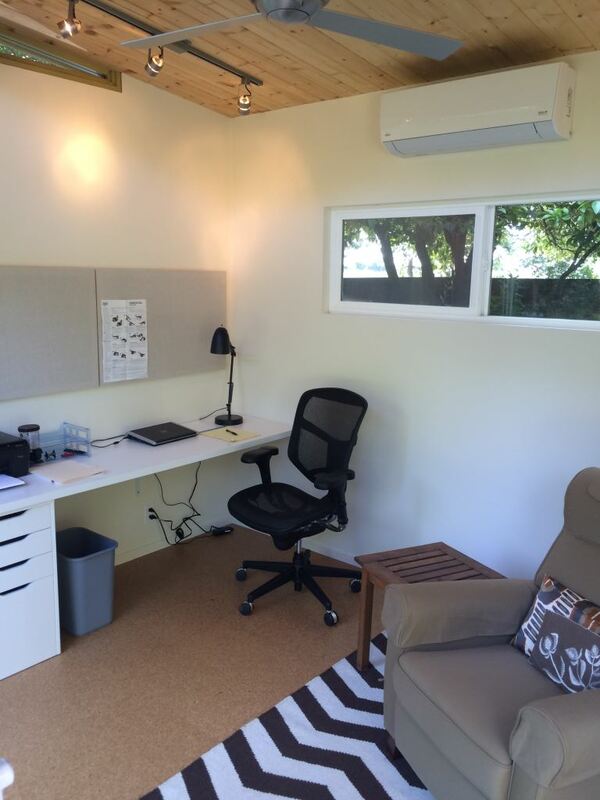 This 10′ by 12′ Modern-Shed serves as an office and work space for Jim. The twin studios have James Hardie on the back side with redwood siding on the front. The overhead trellis and the deck are also made of redwood, matching the redwood accents on the couple’s home.